This is a really great and reliable moving company. Junior, Leungchoi, Jimmy and Eddris went above and beyond in helping our office move! They are a very friendly, efficient and professional team, we really appreciate how carefully they handled all of our items. We definitely recommend this company to anyone who is moving! Thank you NorthStar Team!! We had to move our small warehouse in early July. These guys did an excellent job handling 6 commercial size refrigerators even the there was no dock to unload. They were very helpful and handled any requests we had. I took the time to get their names to make sure they got recognized. The guys on our move were Jorge, Juan, Emanuel and Joe. I will use them on our next move too. Logan and his team are absolutely the best movers we have dealt with. They came in on time and completed the move of my business extremely quick. Everyone went smoothly and they were all a really professional group of guys! I would recommend them and the company. Extremely professional! Vatche and his crew were on time, handled our equipment safely and were friendly on the job. As a professional film/tv music studio, we needed an A-list moving company sensitive to expensive equipment and being on the Warner Brother’s lot. They were attentive to packing specific parts of the studio together for ease on the unpacking end, where they were there to unpack for us. This was our first choice moving company and next choice as we had a good deal also. The whole crew was willing to jump in and go the extra mile so we felt safe with our equipment in their hands. The crew’s truck was far larger and more equipped than we could’ve thought so there was no worry of damaged equipment at all. 5 stars to the crew and to the company!! ALWAYS our go-to guys for any kind of move! Quickest service and always the best guy. Karan, Anthony, Chris and Lloyd were professional, quick, and super accommodating – even helped to put our table back together! Used these guys for a recent office move. We needed to book this move on short notice and Northstar came through for us! Customer service was beyond helpful, the movers came within the scheduled window, and were really fast and efficient, while also being very careful and competent. Would definitely recommend these guys for any kind of move, residential or commercial. Lloyd, Wilbur, Emmanuel, and Jesse moved us back in today and were AMAZING! So friendly and willing to move the extra inch wherever needed. We use these guys every move and are never disappointed! 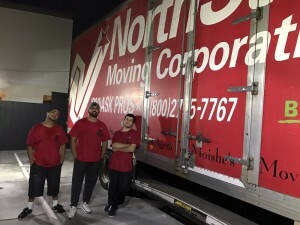 I’ve used NorthStar Moving for my past 4 moves in the last 15 years and continue to receive great service and I am very happy with them. The office staff is professional and follow through with email confirmations and reminders. The movers are equally as professional and on time. This year I had to move a home and separate office into storage for several months, then I relocated 120 miles away. There were a few snafu’s in this process because it was a complicated move. NorthStar handled all of my issues in a timely and professional manner. Thank you Ronald for the excellent job representing the quality and service of NorthStar. I continue to recommend NorthStar to my friends and family. We’ve been using North Star Movers for our business for 10 years and we’ve always been more than pleased with their performance. Today, Jesse, Emmanuel, Kevin and Samuel moved our entire office space in just two hours – amazing! Such nice guys and genuinely wanting to help make the move as quick and painless as possible. Definitely will be requesting these guys again!